For the past couple of decades, All Saints Freethorpe PCC has been wanting to provide modern facilities in the church. As a round tower church, it would have been difficult to get permission to build an internal toilet, and the cost was prohibitive. Peter Allies takes up the story. 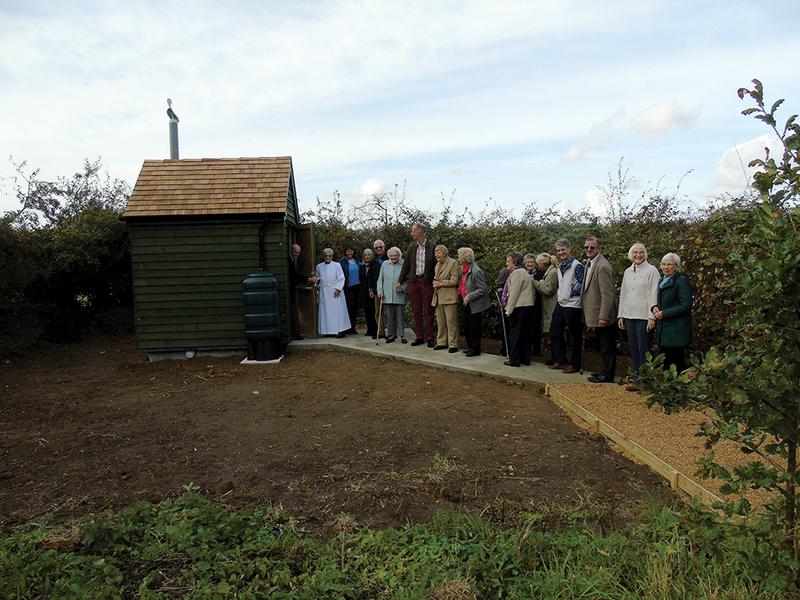 Having looked at similar problems in the past, Revd Dr Lorna Allies, the Associate Priest with responsibility for Freethorpe, suggested a composting toilet in the churchyard would meet the needs at a fraction of the cost. Composting toilets have several advantages for churches like ours. They do not need water or electricity or a septic tank; important in a churchyard, where there are rarely any utilities conveniently near, and where a small footprint is essential. Their design is such that if properly maintained they are also completely odour-free. At the PCC meeting in June, Revd Allies agreed to get details from a company called NatSol, who had supplied composting toilets to other churches. Later, two PCC members went to see another such toilet, and there was general agreement that we should proceed, with the chosen site at the west end of the churchyard, at the end of an existing path, using NatSol as the supplier. It was a long journey. We needed a Faculty and local authority planning permission. It took time to obtain these, but there were no objections. As the site was in a churchyard, we also had to contact Historic England and the Historic Environment Strategy (HES) department within Norfolk County Council to ensure that there were no archaeological concerns with the excavation. Apart from all the legal permissions, we needed to raise most of the cost, which with installation and the path extension came to just over £13,000. We had some restricted funds available and managed to obtain grants which together with anonymous local donations brought us to the total amount. The installation was completed smoothly in a fortnight by mid-October by local builders, Mills Brothers. The shed itself is extremely sturdy, painted a discreet olive green and with a long vent stack, topped by a wind-driven cowl. Someone remarked that it reminded them of the Little House on the Prairie, and it certainly does have that homely, friendly appearance! Inside it is a spacious two by two-and-a-half metres. Apart from the toilet pedestal, it has a pair of urinals – adult and child – because an important part of the composting mechanism is the separation of solid and liquid waste. The shed has a pair of movement-sensitive battery powered LED lights and a footfall counter to enable us to measure usage. An antiseptic gel is provided for hand cleansing. Maintenance is low, little more than any standard flushing WC would be. To qualify for most grants, the toilet needed to be fully fitted for disabled access (which all NatSol toilets are). It also had to be available to the public, not just to churchgoers. So, the toilet is available to anyone who needs it, during the hours that the church is open (normally daylight hours). We were very pleased with the excellent service we received from NatSol and Mills Brothers and would heartily recommend them to any other parishes.